We are so proud and excited to show off our new rocker design. We have been wanting to create this rocker for a year now and the opportunity finally came along to complete it. So it is therefore named “The Shangrila Rocker”. This rocker is all about curves. 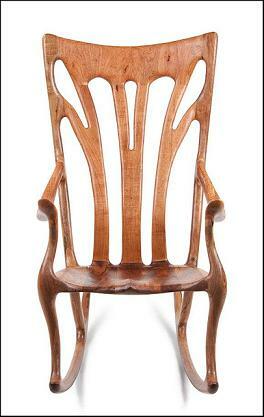 The back legs are all bentwood and formed to give a sensual graceful curve sweeping from the runners up to the headrest. The front legs were made from a solid piece of wood, cut and shaped to give all the different curves. This not only adds interest and beauty, but gives more leg room as well. The carved seat had a slight difference from our others, in that it is shaped into the back lumbar supports. The lumbar supports were originally bentwood, but those didn’t work out and we reused solid thick wood to create them. Each one was cut and shaped for the lumbar support, and made to fan out towards the sides of the back legs and into the headrest. 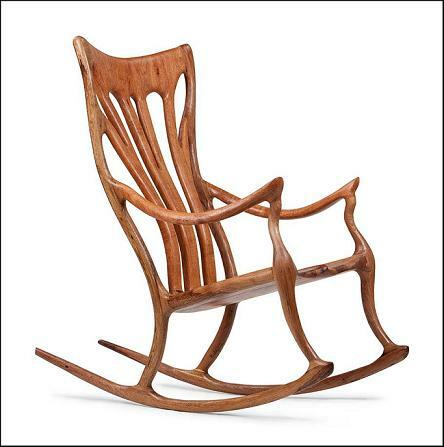 The headrest was created to have the grain run the same way as the rest of the rocker and the back supports were shaped into the it, creating a butterfly effect. The arms sweep down from the back legs, curve outwards and then sweep back towards the front legs, where they are then shaped into the legs. The lumbar support fits perfectly into the lower back and is by far the most comfortable we’ve ever tried. Between the back supports and the arms, this rocker is so comfortable, that you melt right into it. We made this piece out of mesquite, so we could debu it at the San Angelo Mesquite Festival. It has been a huge hit so far. This rocker style will be limited to only 10, signed and numbered underneith the seat. Therefore making it more valuable and unique. This is our own rocker design with no other out there like it. It was time for us to pull away from all the many Maloof style rockers out there and set ourselves out from everyone else. This rocker truly shows Scotts’ artistic talent. You are currently browsing the Shangrilawoodworks's Blog blog archives for April, 2010.